Have you ever wanted to brave the scorching land of Mexico to hunt the rare and valuable Click here to play! chili?? This game is giving you a chance to take on the role of a chili hunter to scour the parched lands of Mexico to round up the spice that will earn you a small fortune! Of course, you're in search of the coveted chilies. Spin three of these on selected pay lines for the highest payouts. Line 1 pays out the least at 1000 credits and Line 4 pays out the most with 6000! Of course there are plenty of other symbols to help you in your hunt. Every chili hunter needs a sombrero to block the harsh rays of the sun. Three of these symbols across any pay line will get you 200 credits. Triple BARS, double BARS and single BARS will also pay off, getting you 50, 25 and 20 credits respectively. Three cacti across a pay line will get five credits, any bar will get you three credits and any two matching symbols will get you two credits. Though this is a 3 reel adventure, there are five different pay lines for you to win on, which will greatly increase your chances of winning. 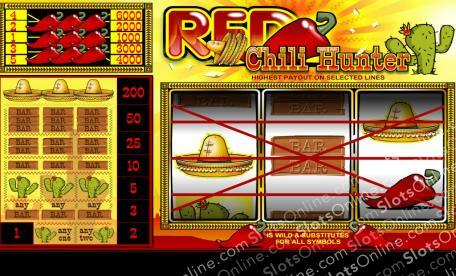 Don your sombrero and scour the land for the red chilies that will bring you a whole lotta green!